Metal machined parts surface finishing is the process required to alter the surfaces of metal products. Workpiece need to last longer to meet their expectations and this to provide resistance from corrosion, reflectivity, electrical resistance, and conductivity. The scratches on the surface are due to the sharpness and type of the cutting tool, and also the material of the products.But usually we apply a finishing process or secondary process to make their surface much more better. The metal machined parts surface finishing techniques are to restore the metal products after periodically using them or in their production. Here are brief descriptions for several mains finishing processes to make surface look perfect. The technique of polishing metals is modifying the metal products surface with the use of abrasive materials and polishing tools. In the different types of polishing processes such as glazing, basic and medium, you can improve the polishing efficiency by using a polishing wheel and a mirror gloss which will improve the accuracy and dimensions of the finished product. One international standard like Ra, Rb, Rc level to judge product surface of roughness level. Sandblasting technique is a simple process that involves spraying the metal products with a high-speed jet of water which contains an abrasive media. This process ensures the surfaces obtain certain degree of roughness and cleanliness and strengthens it resist corrosion. The finished product cleans the burrs and eliminates the dangers that come with them and also the surfaces acquire the reflective look. The size of the spraying grains is called “grit”: the higher the grit number, the smaller and finer the particles are and hence the finer the surface finish they are able to achieve. Sanding is especially useful for contoured or curved surfaces, but it’s not good choice for getting into very tight corners or pockets. Both rumbling and tumbling surface treatment are a process where metal products and a media are a mix in a barrel lined with rubber or wood to cushion the impact in the barrel when it’s in motion. In order to remove the dedurring and sharp points/edges after they are been machined, so we can have better parts look appearance.. Depending on the work pieces and the type of finishing expected, There is many different types of media can be used such as stones, coarse sand and garnet. Detergent is added to the water to help lubricate the surfaces from being worn out and the media from getting clogged with debris from the metal. The level of the finish depends on the speed of the tumbler and its water levels. The lapping finishing process can make part surface very precision and mirror appearance. A lapping machine has two plates that roll at the same time but in different directions and in between them is an abrasive liquid. A work-piece goes through the plates that rub together, and the result is an accurate finish on one side, but it can be two-sided depending on the application and material. The lapping machining requires whole process is very slow speed to avoid heating the workpiece character, So the lapping process is a very special and skilled process to our workers. Sanding process involves rubbing the abrasive particle on the metal products surface, and the finish is of random and non-linear texture. Grit is the cutting component to remove the roughness, sharp points and unflatness for surface of metal. The grit glasses is smaller, the surface is finer and glossier. We used a lubricant flushes the grit over the surface to achieve the ideal finish, look perfect. For a decorative surface, then brushing as a finishing process is recommended to achieve a pattern that is required. The brushing creates various types of line patterns mainly straight, swirled and chaotic. It has a more a metal surface look than a glossy finish on a work piece. Mostly the process is recommended as metal machined parts surface finishing for electroplating. 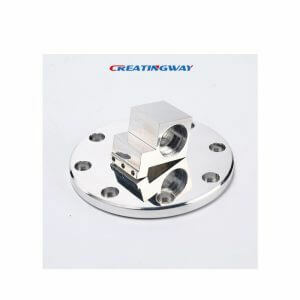 For reliable results, we need to understand the metal machined parts surface finishing and the trending machines in production, So we can produce high quality and user-customized work pieces. The brushing processes will work and exceed your expectations for a super finished product. Which Finishing Process Is Suitable For You? 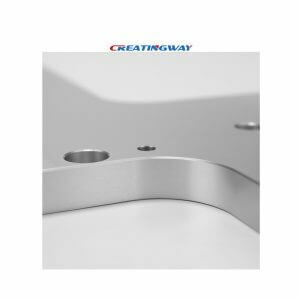 At Creatingway, we use all of these finishing processes and more to make any kind of surfaces you desired on your metal CNC machined parts or rapid prototype parts. If you are ready new projects now, then send out us today, we can tell you how we will put these finishing to your projects in order to make them look perfect.